For this tutorial, we assume that you successfully setup and configured your Wordpress-based Indie Website. Now it is time to post! 1. After you have logged into your WordPress installation through your browser, select "New" and then "Post" from from the top navigation bar. 2. Find a catchy title and write to your heart's delight! When you are done, set the post kind to the kind of post it is in the sidebar. 3. 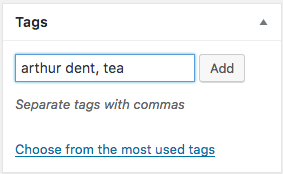 Also tag the post and assign it to the right category of posts on your site, so the search engines can find it more easily. 4. Select "Bridgy publish to ..." and the silos that you want to publish your post to, and then click "Publish". 5. Visit Twitter, Facebook or whatever other silos you syndicated your post post to. While they may not get the update instantaneously, they usually have it rather quickly. 6. Watch comments come in. Your friends might be commenting on Instagram or Twitter, but your WordPress site will end up with copies of their comments. This page was last edited on 12 December 2017, at 19:19.